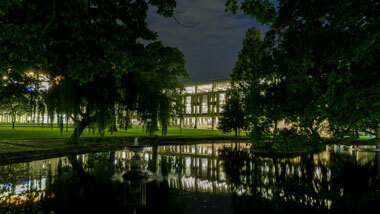 The aspiration was for an enduring architecture: a library building with gravitas and longevity. This is achieved through a clear architectural language; the colonnade activating the landscape and lake, the piano nobile floors and deeply recessed upper storey. 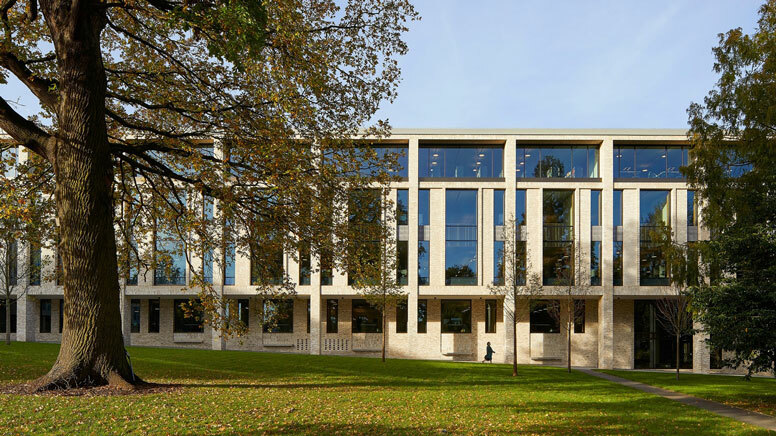 This is continued with a simple palette of high quality materials; externally focused around masonry and reveal, internally the weaving of expressed pre-cast concrete structure and oak linings. 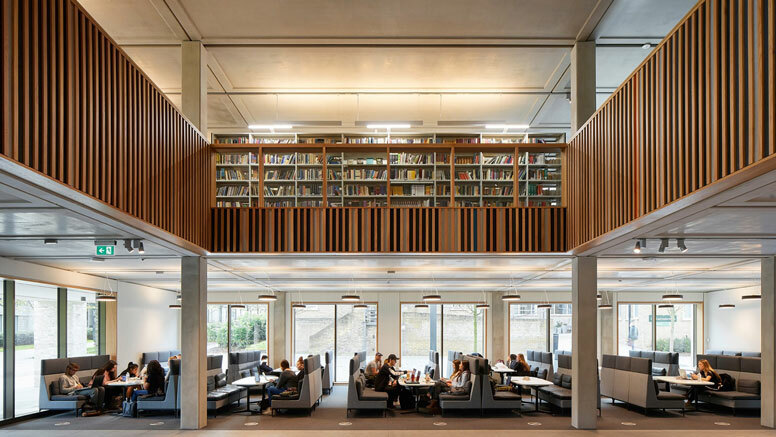 The new Library delivers over 1,200 study spaces, staff support and work areas, specialist digitisation and collection management over five floors and 7,840sqm. It fulfils a number of specialist functions focused around the University’s education and teaching, and celebrates the rich history of the four Colleges that form the University through fixed exhibition spaces. 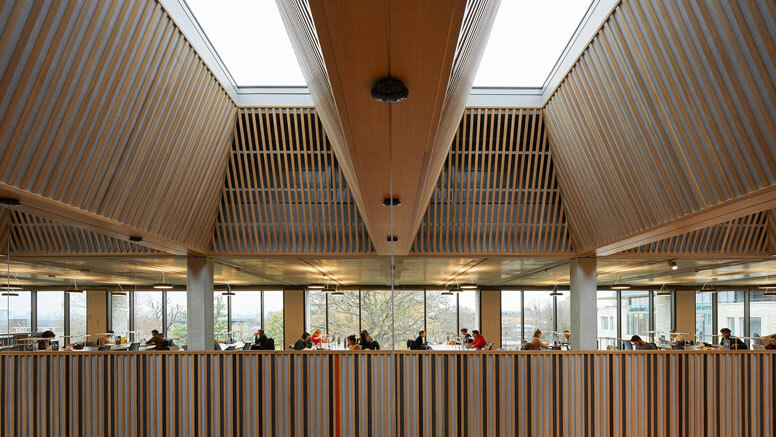 Study spaces within the Library are intended to support a variety of group sizes and work intensities, from individual silent study to medium sized group collaboration, while making use of visual connections to the garden landscape. Internally the building is arranged around large and small atria that allow the spaces to interconnect in a clear, intuitive way. 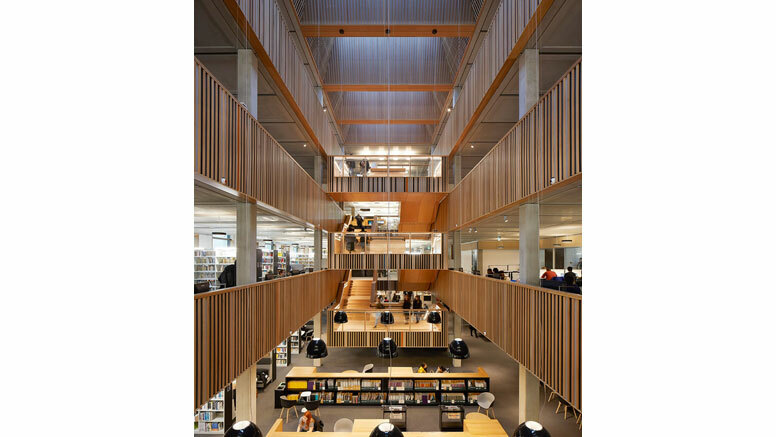 With the books occupying the core of the main library volume, the study spaces are arranged to take in the light and view, and to wrap around the various atria that weave through the building. 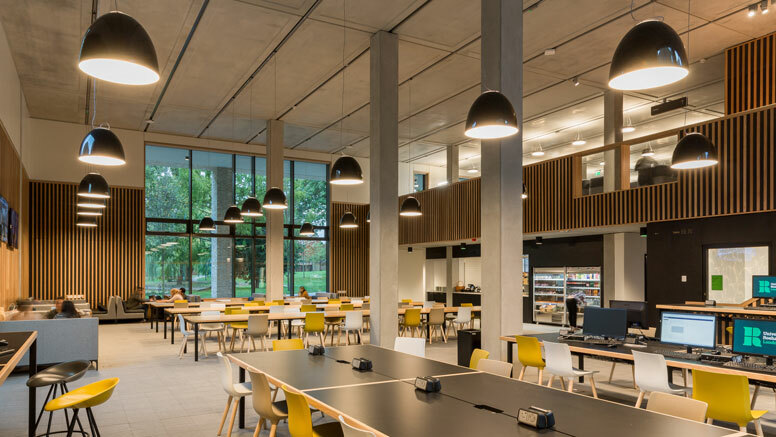 University of Roehampton Library is designed to be a passive building in energy and comfort terms, with highly insulated façades, high levels of airtightness and roofs supported by a thermally activated building slab (TABS) system installed into the concrete soffits. 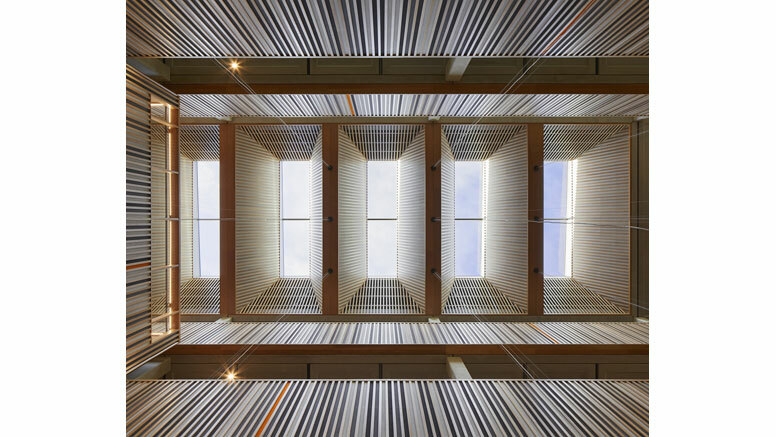 The building also has a roof-mounted 3.5kW photovoltaic array and connection to a combined heat and power unit that also supplies the neighbouring Elm Grove residential and conference centre. 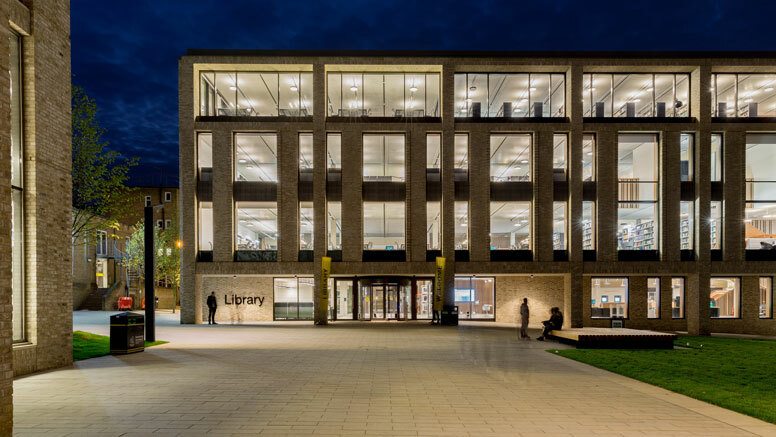 A key part of the project was the extensive use of prefabricated elements, which was particularly relevant and successful given the Library’s location at the centre of an active campus. 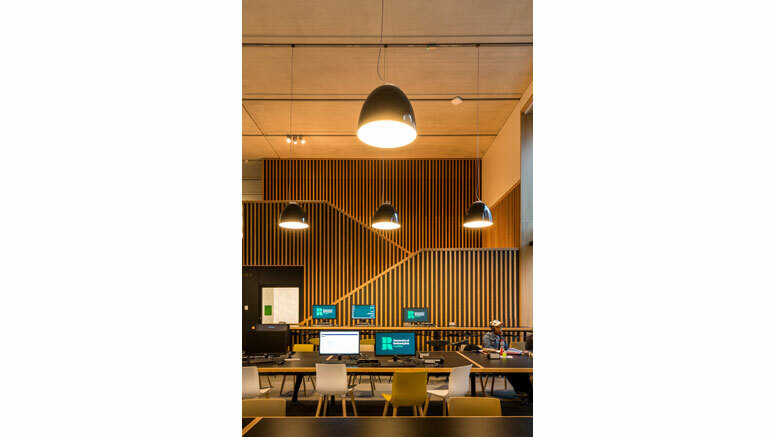 Use of prefabrication enabled a shortened site construction period, reduced disruption to the surrounding University and improvements in finish quality. The project utilised pre-cast concrete for both the primary structural frame and external cladding, and large parts of the internal timber linings. Project profile on the FCBStudios website.